"Endlicher, Stephan Ladislaus". The American Cyclopædia. 1879. 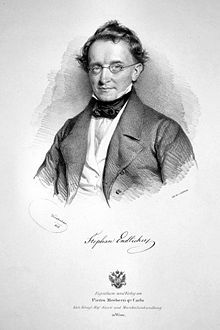 "Endlicher, Stephan L. (1804 - 1849)". Collectors & Illustrators. Australian National Herbarium. 13 November, 2007. Davis, John B. Chronicles of Oklahoma. Vol. 8, Number 2. "The Life and Work of Sequoyah." June, 1930.